What Day Of The Week Is May 28? 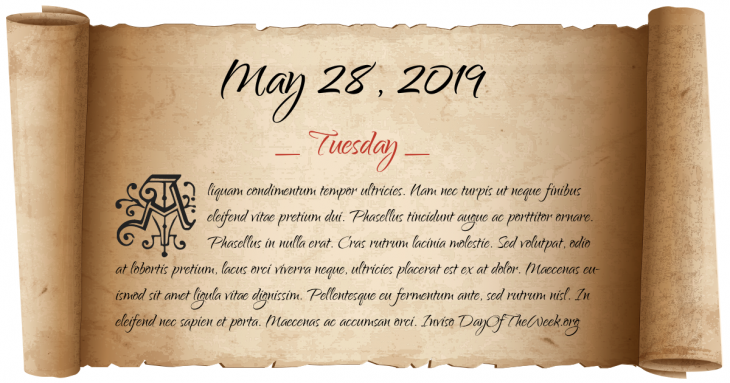 May 28, 2019 is the 148th day of the year 2019 in the Gregorian calendar. There are 217 days remaining until the end of the year. The day of the week is Tuesday. A solar eclipse occurs, as predicted by Greek philosopher and scientist Thales, while Alyattes is battling Cyaxares in the Battle of the Eclipse, leading to a truce. This is one of the cardinal dates from which other dates can be calculated. The Spanish Armada, with 130 ships and 30,000 men, sets sail from Lisbon heading for the English Channel. (It will take until May 30 for all ships to leave port). Bolton Massacre by Royalist troops under the command of the Earl of Derby. The Azerbaijan Democratic Republic and the Democratic Republic of Armenia declare their independence. The Chrysler Building in New York City officially opens. Near Callander, Ontario, the Dionne quintuplets are born to Oliva and Elzire Dionne; they will be the first quintuplets to survive infancy. Who were born on May 28?